Ned Kelly is an icon; he is a crucial part of Australian history and was an 'outlaw' (a 'bushranger' in Australian terms). He 'is considered by some to be merely a cold-blooded cop killer — others, however, consider him to be a folk hero and symbol of Irish Australian resistance against the Anglo-Australian ruling class'. Shown is an Australian 1995 stamp celebrating the film 'The Story of the Kelly Gang' which was made in 1906 and which was the world's first feature film. 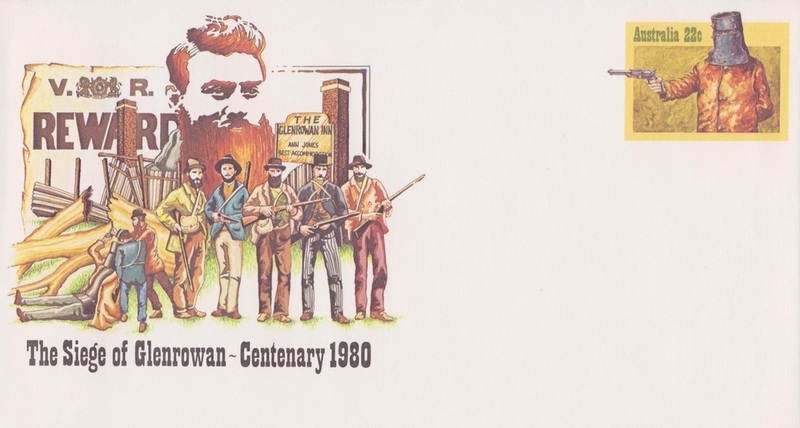 Ned Kelly has also appeared on a 2003 Australian stamp and Irish 2001 stamps. There are some interesting films about him (one starring Mick Jagger as Kelly), some important art, and one of Australia's greatest novelists - Peter Carey - has 'fictionalised' the life in his The True History of the Kelly Gang. So the life (and myth) continues to be a crucial part of Australian culture and history, with some aspects of Robin Hood. His fascinating story is easily available to be read on the internet. And there is a Gunn link!